Pasco County Florida is just north of Pinellas County. You'll find many desirable and inexpensive waterfront communities with a variety of waterfront homes that have direct Gulf access. Typical asking prices compared to Pinellas and Hillsborough Counties are much lower. There's direct access within minutes to the open Gulf of Mexico. Note the construction of the parallel canals. The depth of the canals vary from approximately 12 to 30 feet and are perfect for deep draft sailboats. 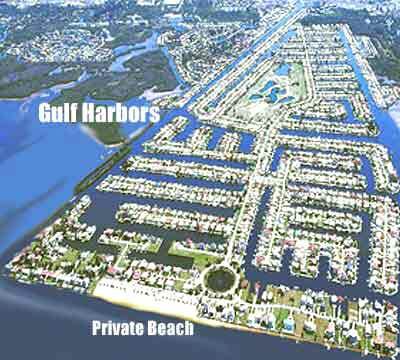 There is a also a private beach right on the Gulf for community homeowners. The canals in Gulf Harbors are not typical to Florida canals. They were excavated out of the limestone bedrock. It allows the rock bottoms of the canals and channels to allow an exchange of water with the movements of the high and low tides. The waterfront homes have quick access to the Gulf of Mexico for fishing and pleasure boating. 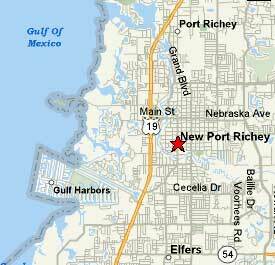 New Port Richey is approximately thirty miles northwest of Greater Tampa and approximately 10 miles to Pinellas County.